While reading Practical Housekeeping: A Careful Compilation of Tried and Approved Recipes, dated 1883, I came across an interesting tidbit. It is a recipe for Phil Sheridan Cake! Four cups of white fine sugar, five of sifted flour, one of butter, one and one half of sweet milk, one teaspoon of soda dissolved in the milk, two of cream tartar, whites of sixteen eggs; stir sugar and butter to a cream, then add the whites of the eggs beaten to a thick froth, next add flour, then the milk and soda; stir several minutes, and then add cream of tartar and flavoring. This makes a large cake. The above recipe was provided by Mrs. Mary S. Moore of Granville, Ohio. Given the ample ingredients, I am sure that it does “make a large cake.” In fact, it may take Sheridan’s whole army to polish off such a grand cake! One does not know if the above mentioned recipe was a favorite of Sheridan, named for Sheridan, or given the large fat content, is intended to allow you to join the good General in an early grave! It must be noted that the ample Sheridans had heart issues. NO WONDER! Good grief! The above engraving was taken from the same book. 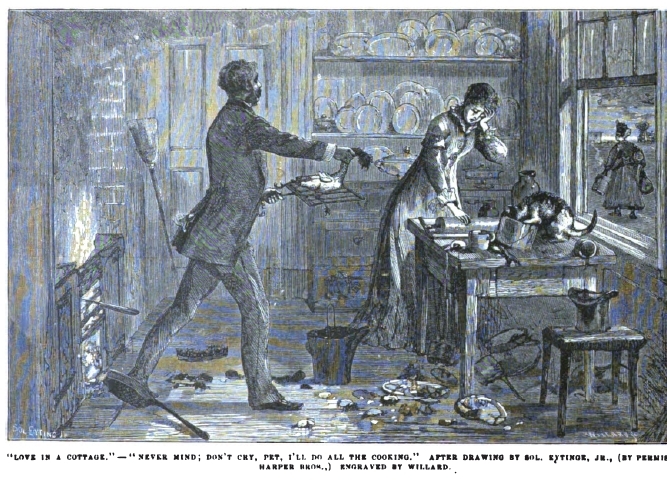 Note the poor little housewife is seemingly so incompetent in her domestic skills that her husband must take over all of the cooking. What on earth would Nellie think of this? Suffice it to say..she would not be a happy girl. This sort of sexism was the norm during her time. Perhaps, this is the reason why she waited so long to marry her love of fifteen years. It is enough to give a girl a complex! To add insult to injury, the book is dedicated to “those plucky housewives who master their work instead of allowing it to master them.” Tsk, tsk!